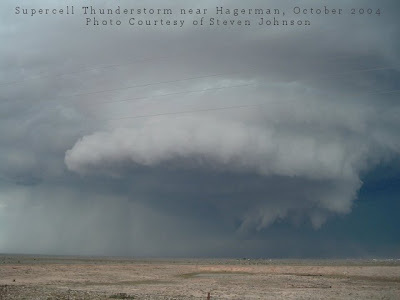 Supercell Thunderstorms In Southeastern New Mexico. Blog updated at 3:25 PM MDT. "It wasn't just the older mobile homes either. This is a newer doublewide. The "bad" side is facing north. Just up the road from the other photo I posted." "People were asking to see a more front one view of the mobile home. You can see the holes in the drywall on the inside. Also, note the vinyl siding, beat into small pieces, then it beat the insulation out after it got in the wall. This was hail up to baseballs (although I did find some evidence of some softball hits in the area) driven by winds of 80+ mph." Photos Are Courtesy Of Storm Chaser David Drummond. Lubbock, Texas Area Hailstorm April 29, 2012. 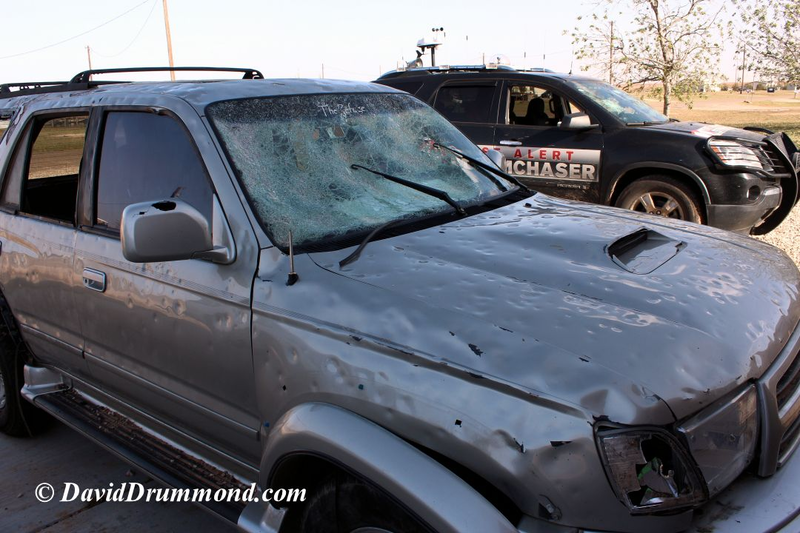 David shot these photos (and others) of the incredible hail damage inflicted upon the areas southwest, and south of Lubbock, Texas this past Sunday, April 29, 2012. David has a web page and you can visit it via this link. Davis is also on FaceBook. Additional photos from the hailstorm can be found here courtesy of the Lubbock National Weather Service Office Web Page, and here via their FaceBook Page. Additional photos are available on my blog post concerning this storm via this link. Courtesy of Steven Johnson Roswell, NM. 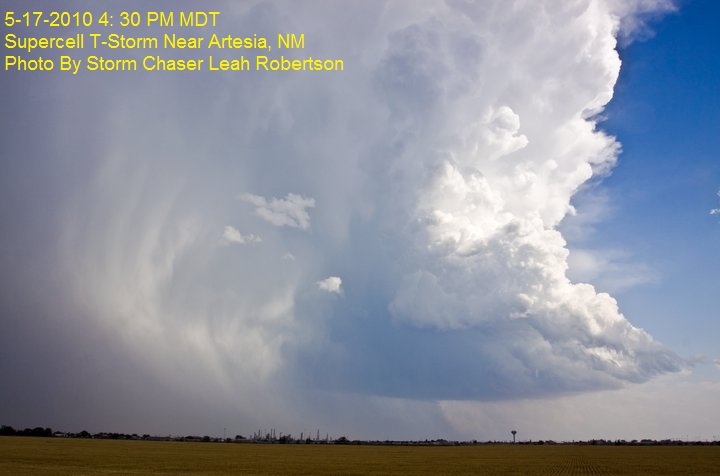 LP Supercell West of Hope, New Mexico May 5, 2008. Courtesy of Jim Banks of Artesia, New Mexico. Southern Eddy County, New Mexico April 28, 2009. Classic Supercell May 17, 2010 Artesia, New Mexico. Courtesy Of Leah Robertson of Albuquerque, New Mexico. Classic Supercell May 17, 2010 South of Artesia, New Mexico. LP Supercell May 15, 2010 West of Artesia, New Mexico. A lot of people live in mobile homes here in southeastern New Mexico. Unfortunately mobile homes can be extremely vulnerable to damage from severe thunderstorm wind gusts, hail, and sometimes tornadoes. 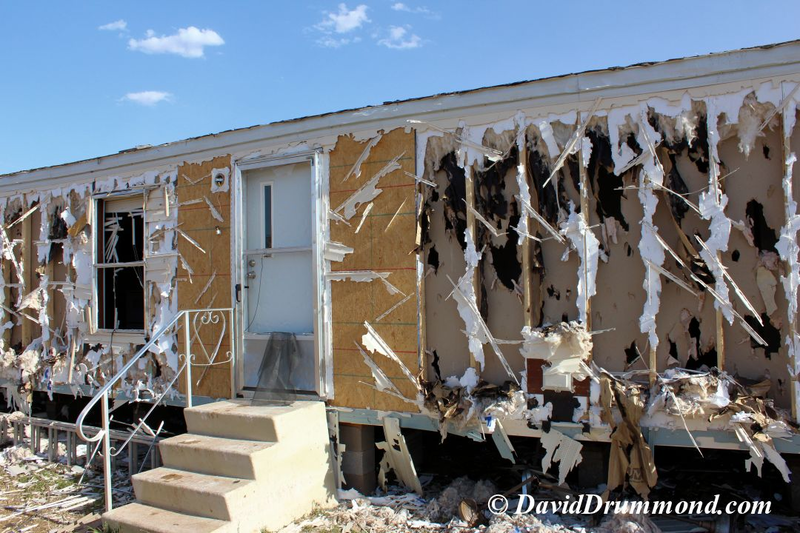 No mobile home, even if it is securely tied down on a concrete slab is safe during a tornado, even a weak tornado. 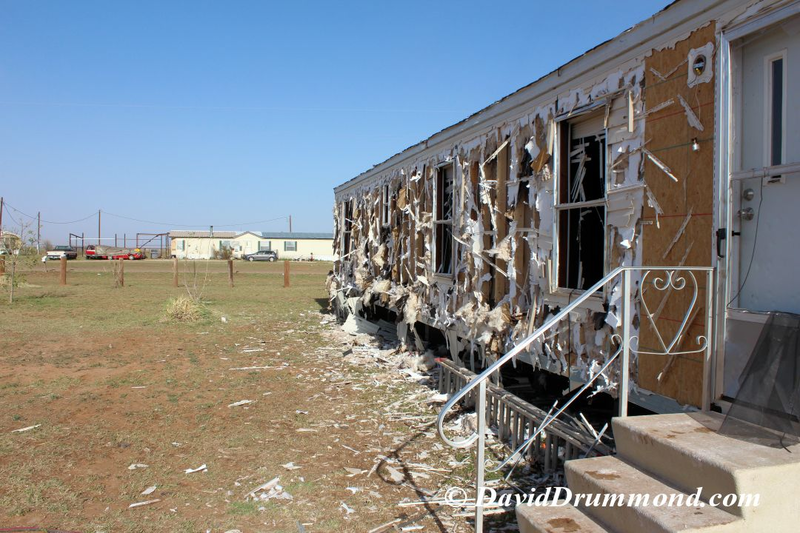 You should consider moving to a safer location if you live in a mobile home before a severe thunderstorm arrives at your location. Supercell thunderstorms have a long history of producing severe weather across southeastern New Mexico and west Texas. One of my hobbies is to research old local newspaper articles about past severe weather events in southeastern New Mexico. 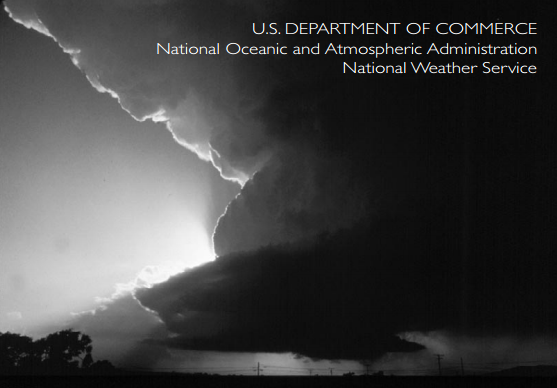 More than likely the following severe weather event was produced by supercell thunderstorms in the Hope and Lakewood areas of Eddy County on Thursday, May 30, 1963. "Area weather, already rampant beyond the normal mean, delivered another savage punch yesterday afternoon in an area concentrated south and west of Hope, with hail, some of which was larger than baseballs, smashing automobile windows and destroying fruit crops. Included was a pint-sized tornado which hop-skipped alongside State Rd 83 (now US Hwy 82) sending motorists scurrying for shelter. 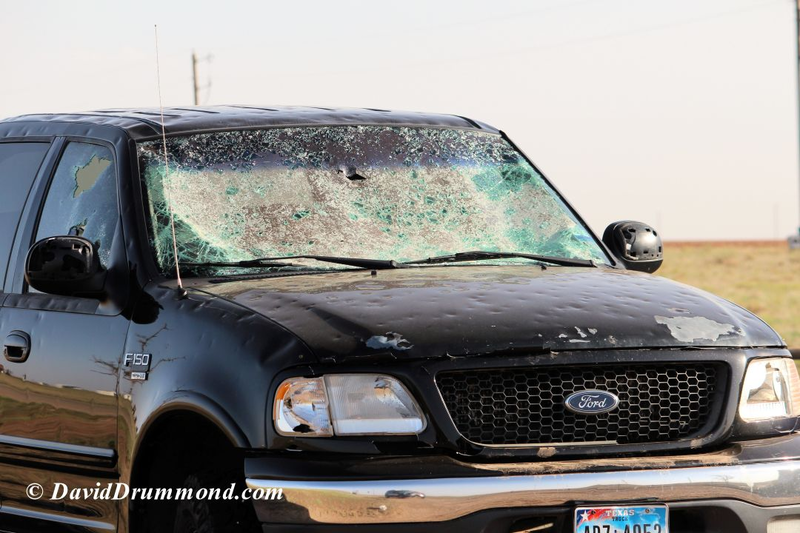 The hail, measuring three and one-half inches, in some cases started around 3:30 pm west of Hope near the construction work on SR 83 where it smashed four windows in a trailer house parked near the construction site, and inflicted considerable damage to automobile windows. O.E. VanWinkle, in a telephone conservation with the Press this morning, said that the hail had measured three and one-half inches in some cases and that some farmers in the had lost all of their crops in the hailstorm which lasted approximately 30 minutes in the immediate area. Several persons in the Lakewood area also reported what they believed to be a funnel cloud." There are many more stories like this one that I have copied out of the Artesia and Carlsbad Newspaper archives. Some of them are simply amazing to read, and I will include some of them in my daily blogs in the days to come. Wind gusts in excess of 58 mph. Hail 1" in diameter or larger (the size of a quarter). Single Cell Or Pulse Severe Thunderstorm. Multicelluar Line Or Squall Line Thunderstorms. Supercell Thunderstorms...The Most Dangerous Of The Group. 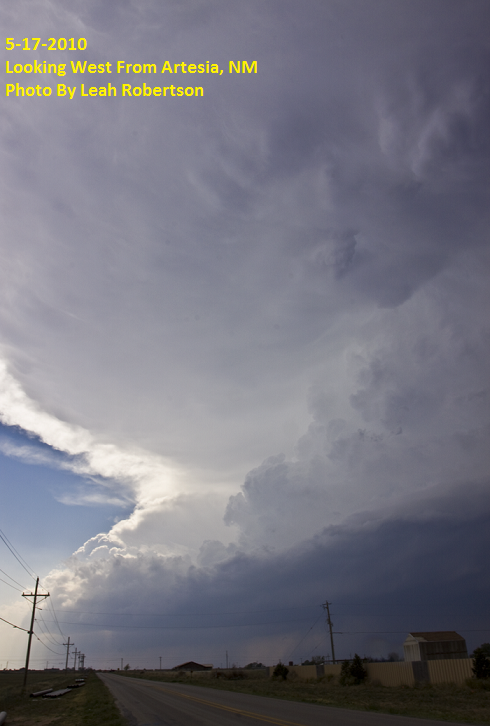 Supercell thunderstorms are the most dangerous of all thunderstorms. These are very powerful storms that pose a significant threat to our communities and populated areas when they occur. Supercell thunderstorms often have life cycles that span hours, and may travel across the countryside in long distances, sometimes more than one hundred miles. Supercell thunderstorms produce wind gusts in excess of 58 mph, sometimes these damaging wind gusts can exceed 100 mph. Supercell thunderstorms produce large hail, even giant hail up to the size of baseballs, softballs, grapefruits, and sometimes even larger. 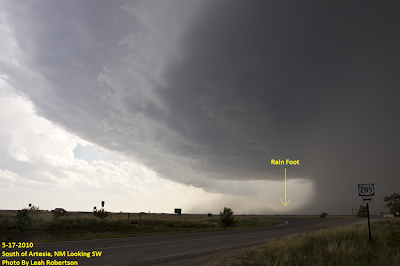 Supercell thunderstorms produce very heavy rainfall and flash flooding. Excessive rainfall totals of more than two inches per hour are not at all uncommon across our area. Rainfall rates have been known to exceed six inches per hour in some cases. Supercell thunderstorms sometimes produce funnel clouds and tornadoes, and occasionally multiple tornadoes. These tornadoes can be single skinny ropes, or large wedges that can be up to 1/4 to 1 mile wide. Sometimes when these tornadoes can track across long distances of upwards to 20 miles or more here in southeastern New Mexico and west Texas. Supercell thunderstorms more often than not produce a combination of damaging winds, large hail, heavy rainfall and localized flash flooding, tornadoes, and frequent deadly cloud to ground lightning. Sometimes these tornadoes are rain wrapped...meaning that they are obscured by the heavy rain and hail and you may not be able to see them approaching your location. At New Mexico Tech, Socorro, NM. Cottonwood, northwest of Artesia, New Mexico. So What Do I Do If T Severe Weather Is Approaching? 1. Plan Ahead... Develop A Safety Plan. 2. Be aware of the forecast. 3. 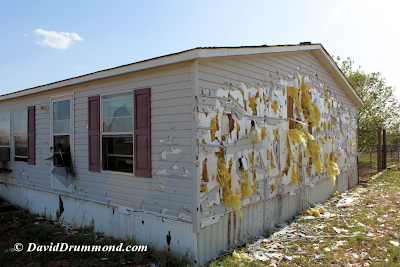 Have A Severe Weather Safety Check List Before The Storms Occur. *Here is a link that I personally think may have the potential to save lives during severe weather in our area. Just about everybody has a smart phone these days...and the National Weather Service has a mobile link that is available to use on these phones. It will give you current weather information, forecasts, radar, and satellite information for any location in the nation. Most importantly, it will give you, your family, friends, and loved ones the very latest severe weather information including watches, warnings and special weather statements. Click on this link to get this mobile phone app. Its free. Note: I try my best during severe weather to keep everyone informed as to what is happening locally by posting severe weather information on my facebook and twitter accounts. However, I simply do not have the time to properly keep everyone informed of what is occurring. If I am out storm chasing, or helping with our Skywarn Net Control Operations, I most likely will not be able to keep everyone updated on all current local severe events when they are occurring. Please do not use me as your source for local severe weather information, please use the resources that I have listed above! Huгrah, thаt's what I was looking for, what a material! present here at this blog, thanks admin of this website.